The Editor-in-Chief of the British medical publication The Lancet has apologised for the polarization created by an article accusing Israel of war crimes. NGO Monitor has issued a statement requesting the removal of the offensive material from The Lancet’s web site. Professor Richard Horton, Editor-in-Chief of The Lancet, has completed three days of seminars and meetings with senior researchers and physicians at Rambam and the Technion’s Ruth and Bruce Rappaport Faculty of Medicine. His visit was initiated by Professor Karl Skorecki, Director of Medical Research at Rambam, and Professor Rafi Beyar, Director of Rambam, followed by the endorsement of the Israeli Ministry of Health, following The Lancet’s publication of a controversial open letter that accused Israel of war crimes. Horton’s visit included tours of some of Rambam’s medical units, a series of medical and ethical lectures, discussions, debates, and visits to Nahariya’s Western Galilee Hosptial, Isifiya and Acco. Tuesday was an intensive day that included a discussion on Science & Medicine as a Catalyst for Peaceful Coexistence, coordinated by Professor Zaher Azzam, Head of Internal Medicne B at Rambam and Vice Dean of the Technion’s Faculty of Medicine. Professor Asa Kasher an internationally renowned ethical philosopher spoke in the evening on the Ethics of Armed Conflict and Responsible Scholarly Journalism, where ethical consideration regarding publication of the problematic letter in The Lancet were openly discussed. In a potentially charged atmosphere, the discussion was handled with the utmost of respect, scholarship, and professionalism, with Kasher and Horton shaking hands and continuing their discussion after the lecture had ended. On Thursday a formal intellectual debate was held, with the resolution: Publications which promote political agendas have no place in scientific and medical journalism and academics should refrain from publishing in such journals. The Pro and Con resolution contestants were asked to present their points without regard to their own personal opinions. The debate contestant arguing in support of the resolution was A. Mark Clarfield, Professor of Geriatrics at Ben-Gurion University; opposed by debate contestant Rael Strous, Professor of Psychiatry at Tel Aviv University. Professsor Shimon Glick, Emeritus Professor and Dean at Ben-Gurion University and Emeritus Ombudsperson for the Israel Ministry of Health, moderated the scholarly session. Horton also met with physicians who had worked in the battlefield during the Gaza conflict and treated both Israeli and Gazan casualties and expressed their clear mandate to treat all injured and suffering individuals with equal and equivalent medical attention at all times. Horton concluded his visit on Thursday with a lecture in the Rambam Grand Rounds, entitled Geopolitical Issues and Responsibilities of Medical and Scientific Journals. Speaking to a standing room only audience, Horton began on a personal note, by stating, “I need, very honestly, to set the record straight with you. First, I deeply regret the completely unnecessary polarization that publication of the letter by Paola Manduca caused… Second…I was personally horrified at the offensive video that was forwarded by two of the authors of that letter. The world view expressed in that video is abhorrent and must be condemned, and I condemn it.” After a round of applause, Horton continued, “I will be publishing what I have just said in The Lancet next week.” Horton also expressed his clear opposition to boycotts in general and to BDS in particular. NGO Monitor has released the following statement: “Dr. 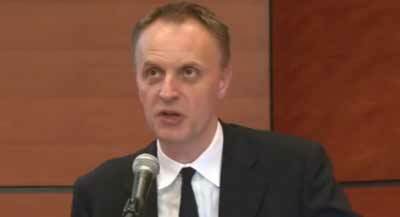 Richard Horton came to Israel following intense criticism of his activities as editor of The Lancet. In this visit, he has expressed regret, condemned the contributors to The Lancet who promoted explicitly antisemitic materials, articulated a new understanding of Israeli realities, particularly the complexities of the Arab-Israel conflict, and pledged a new relationship with Israel. On this basis, and in light of the revelations regarding antisemitic comments and materials disseminated by Drs. Manduca and Swee Ang, it is urgent that the July 2014 “An Open Letter for the People of Gaza” be removed from The Lancet’s website and a formal retraction and apology be published prominently, both on the website and the next hard copy issue. sponsorship and publication in any form of activities and related material, including those involving political advocacy NGOs, from which professionally qualified Israelis are excluded. In addition, it is important that The Lancet undertake positive initiatives to accurately inform the medical community of Israel’s contributions to medicine, as well as the close cooperation that takes place between different sectors of the population. In order to accomplish these criteria and ensure their implementation, we urge the establishment of cooperative follow-up mechanisms regarding issues related to Israel and The Lancet, in order to prevent a return to the demonization of the past. In addition, it is important to review Lancet articles related to Israel published since 1 January 2001, determine whether and which articles fail to meet established scientific standards, and to issue retractions.